Another day, another test | Im CrohnsFighter and this is My Fight against Crohn's Disease. I went to the hospital this morning to have an Upper GI scan. While in the waiting room, I decided to look up the procedure on my phone to see exactly what I was getting into. I was very surprised when I saw that the test could take 3 to 6 hours! I hoped I 'd be out in 15 minutes. When I go to the back, the two techs had me chill on a xray table. Didn't have to take off any clothes, so that was a plus. After a few quick pictures of my stomach empty, we moved on to the horrible part. The barium solution was awful. It was very thick and chalky. The taste itself wasn't so bad, sort of sweet, but the feeling of it in my mouth wasn't great. After drinking one cup of the gross liquid, I thought I would be able to down the second. After a few sips, my stomach felt full. I knew what was coming next. The radiology tech heard me gagging out side the room and asked if I needed something to vomit into. I thought I would be able to tough it out, but my stomach decided otherwise. 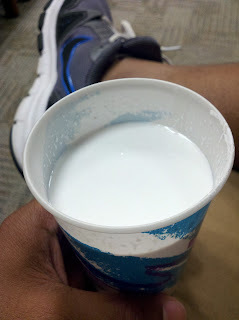 After I threw up the barium, they sat me back in the waiting room, and left me with another cup to drink. I was able to drink around half of the cup. Lucky for me, that was enough to get the images needed.